For this fortnight Patter has given us the word "Identity" for our Scripture art. 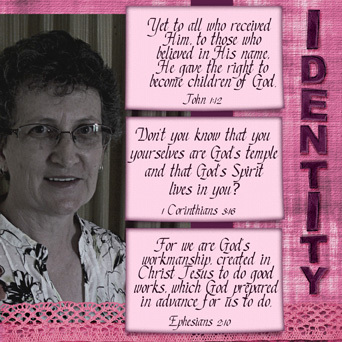 Her devotional thoughts shared some of what our identity in Christ is and how it should be revealed in how we live. I know I do fail my Lord so often with this. Sometimes I wonder if people around me really do know that I am a "Daughter of the King". Lately I feel God is teaching me that I need to stop and look at my life and see the areas where I am not as obedient as I ought to be. The photo on this page of course, is me. I chose three verses from among so many that tell us about our identity when we do accept Jesus as our Lord and Saviour. I pray that somehow these three verses may be a blessing to those who read them here on my blog. For my digital artwork I used an alpha, background paper and lace from a kit called Berries Jam by Caroline B.